Killer Characters: Gipping's Paramedic Extraordinaire! Today, aspiring investigative reporter Vicky Hill from the Vicky Hill Mysteries is introducing her admirer, Steve Burrows to Killer Characters. I must admit I was quite chuffed when the gorgeous Vicky Hill asked if I’d say a few words on this blog. Sometimes I feel like she doesn’t care but when she invited me … well … it just made my day. Allow me to introduce myself. My name’s Steve Burrows and I save lives. Yep. That’s right. I save lives. 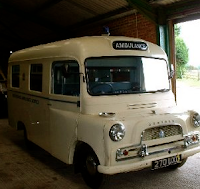 I work as a paramedic for our local hospital in Gipping-on-Plym. As a matter of fact, that’s how I met Vicky. A colleague of hers, the gorgeous Annabel Lake (there are a lot of gorgeous women in Gipping-on-Plym) had taken a tumble down the basement stairs at the Gipping Gazette and my co-worker Tom and I got called out to the scene. I’d be lying if I didn’t say it was love at first sight when I first saw Vicky Hill and her sapphire blue eyes. I’d drown in them if she’d give me half a chance. She’s a shy one, that girl but I know I’ve got to take it slow. I like buying her Cadbury’s Milk Tray chocolates, pink carnations and taking her out for a curry to the Lali Poo in Chagford. I’ve also programmed my iPhone with a Dancing Queen ringtone from my favorite group, ABBA. The problem is that Vicky’s work gets in the way of us and I don’t know what to do. She says, “Steve, my career comes first and it’s better we are just friends,” and I respect that. I tell her, “Steve’s not going anywhere, doll” and I tell her she can have all the time she needs. I mean, I’m thinking marriage, kids, a dog—maybe a canary. Know what I mean? Vicky needs someone to take care of her and given the family history—her parents were eaten by lions in Africa—how does someone ever really get over that? But I’m patient and I’ve been trained to handle all kinds of disasters. I’ll wait for Vicky forever. No doubt Vicky will be annoyed with me for spending time on this blog talking about her when she really wanted me to talk about a day-in-the-life as a paramedic, but I just can’t help myself. She’s my soulmate. Should I try harder? Maybe you folks out there can give a poor man in love some advice? Steve, you're doing the right thing for now. Just being there for her when she needs you will hopefully open her eyes that she can have her career and you at the same time. Steve says: Dru, you're a doll. You've made me a very happy man. A very happy man indeed. Patience, right? Steve - stay the course! Obviously you are the man for our Vicky and you have proven your devotion and suitability over and over with chocies, curry, life saving and all that. Steve says: Sheeesh ladies. What a lucky man I am to have so much support. I think I'll start saving up for that engagement ring. I was thinking of a solitaire diamond set in platinum? Or maybe a sapphire to match her eyes? Aw, Steve, I really want Vicky to "get" you. Good luck! Okay Steve, first off who ever said love was easy? I was always told if you want something bad enough, as it sounds like you do, you must apply all your abilities to the task at hand, so no matter what Vicky says if she is the girl of you dreams then you must, and I say must again, do all in your powers of being to make that happen. Vicky obviously doesn't know a good thing when she sees it, Steve. However, sometimes a girl gets wrapped up in her career, and you have to be supporting. Steve says: I am tickled pink by your enthusiasm. You're right, I'm going to do all I can to let her know how I feel. I'm making a note of your names to make sure you will all get an invitation to our big day ... whenever that may be.